Despite warm, dry hunting conditions last fall, hunter success in the Idaho general elk hunts was actually higher than in 1998. Many hunters complained about the weather conditions during the October elk season and game managers anticipated mediocre harvest numbers, but newly available statistics indicate better hunting than expected. Estimates based on telephone surveys of hunters have just been completed. Figures for controlled elk hunts and for deer seasons are still being compiled. Statistics from the mandatory hunter harvest report system are not yet available because hunters have been slower to file their reports than they were last year. Previous experience indicates, however, that the two different methods of estimating hunter harvest are closely comparable. The estimates for 1999 general elk seasons show more hunters taking part, 82,391 compared to 80,700 in 1998 with a hunter success rate of 14.4 percent last fall versus 12.9 percent in 1998. 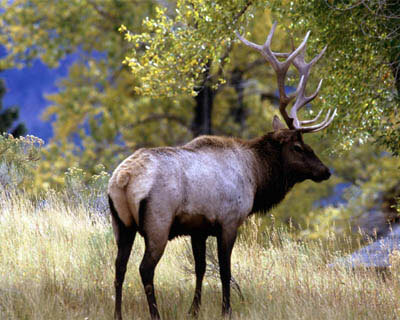 The total estimated general elk harvest was 10,983 last fall and 10,386 in 1998. Total days spent afield by hunters was also up slightly. The survey shows a slight shift toward taking younger bulls with 39 percent being spikes versus 34.4 percent in 1998. The harvest of big bulls, six points or better, was down from 24 percent in 1998 to 20 percent last fall. The Panhandle Zone had far more hunters than any other of the 28 elk hunting zones in Idaho.